According to the Economist, over 2.5 billion people have at least one messaging app installed and will reach 3.6 billion in couple of years. That is half of the worldwide population! The younger generation spends more time on smartphones and messaging apps than perusing social networks, websites and physical stores. Bots cannot be ignored. It should be part of any company’s marketing strategy as another distribution vehicle. With so many customers on multiple platforms, it makes business sense to integrate these messaging platforms into your customer engagement arsenal. Bots serve as a brand extension by leveraging your product and services to better serve people. The key to brand engagement is through personal interactions. A bot allows a brand to personally connect with millions of people at the same time. Bots can be programmed to sell your products increasing your overall sales number. Traditionally store clerks and sales reps at retailers are encouraged to cross-sell products in order to maximize customer potential sales. With bots selling the product directly to the consumer when request eliminates the need to cross-sell (the bot essentially is doing the cross-selling and more). Bots whose purpose is to facilitate transactions can especially be powerful if you combine it with a social ad campaigns triggering the activation of the bot when your target audience has seen your ad. By educating and engaging your customers in a more conversation way, a brand has the opportunity to use bots as their own sales force. A bot can be an arsenal to your growth engine as part of your marketing tactics. Bots should be used as part of your conversational marketing plans. Adding conversational bots combined with your customer success team enables you to provide excellent customer experience adding to your brand value and return customer. Bots are an effective tool for engaging new and re-engaging past customers by leveraging coupons and specific promos. Through conversations with bots, brands can learn what interests the customer has directly from them. The bots can then push the coupons and promotions (QR codes, Images, Links) to the users, similar to push notifications. One key advantage is users can easily request the bot to send over the coupon thus giving data on which user particularly is interested and at what moment. These behavioral insights give ways for marketers to learn more about their customers. Bots can be a playful and fun interactive experience. They can also aid your brand evangelist in sharing your product while creating new advocates. By building a strong customer experience, you build brand loyalty and increase the chances of your customers referring other customers. A Bot Assistant to a Real Agent — speed up minor tasks so your agent can focus entirely with your customer. Your customers feel more secure talking to an actual person. This hybrid approach allows your agents to manage the relationship while bots help speed up the conversation flow. How Companies use Bots today. Some bots are used to handle a variety of customer service requests, which would normally require a telephone call to a human agent. These bots are able to process and provide the necessary help freeing the agent to handle more difficult support task and lessening the burden on companies without having increase staffing. Other bots allow customers to order and pay for goods. Most companies are only scratching the surface of what bots can bring to a business. Here are couple examples used by big retailers to improve their customer experience. 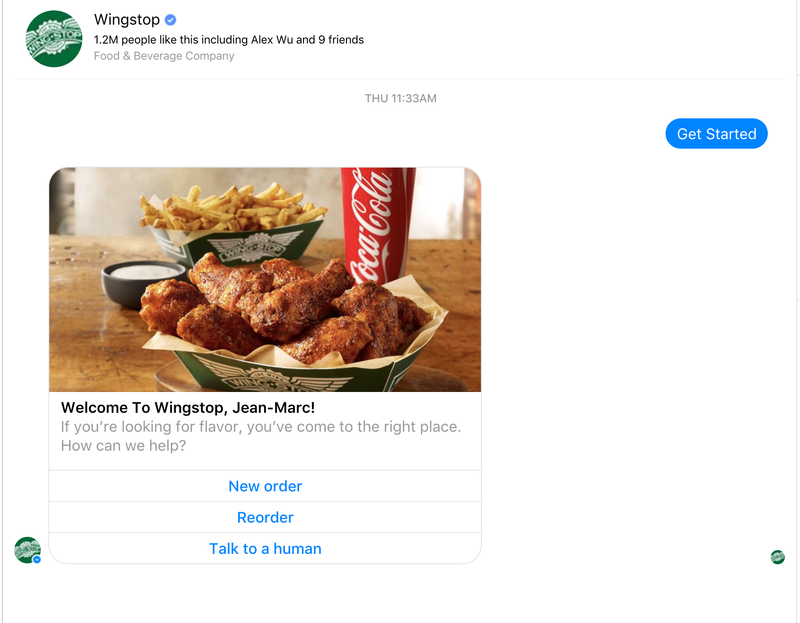 Wingstop created a Facebook Messenger bot letting people order food and beverage right from Facebook without leaving. This means that a customer can keep interacting with their social peers while purchasing goods and leads to better conversions of sales. There is no limiting action, distraction or competing offers to break the customer journey. 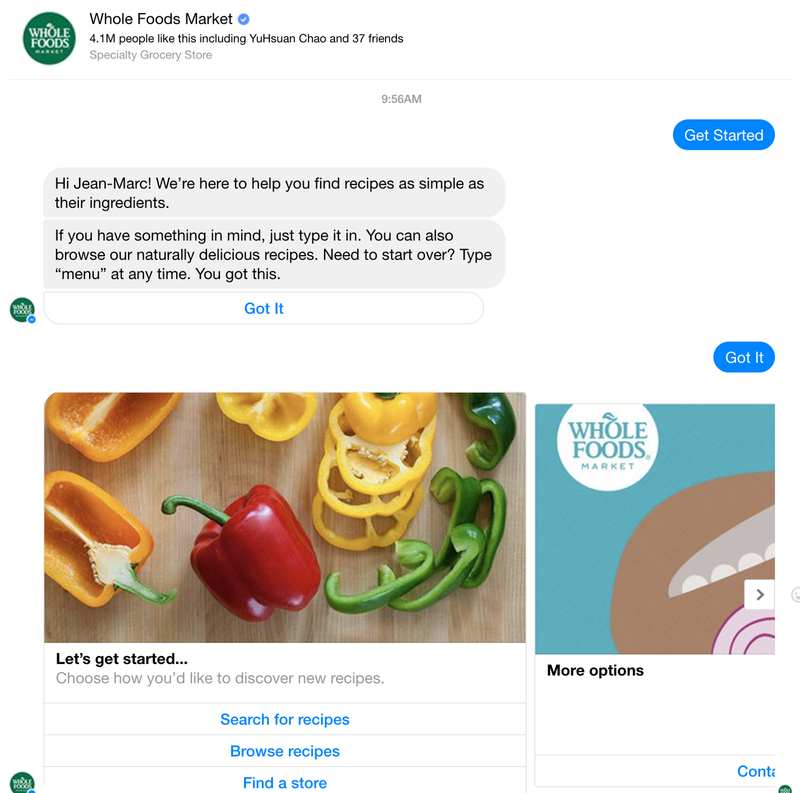 Whole Food Market has a messenger bot that helps people search for recipes or DIY meals. You can also ask for nearby locations making it easier for people to find the retailer. 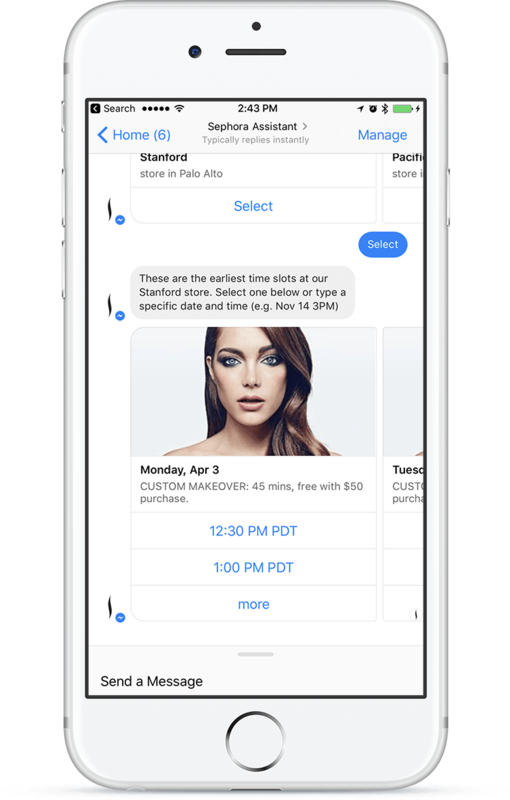 Sephora has a messenger bot allowing people to conveniently book makeovers. This is especially powerful if they combine in with personalized emotional ads to reach women who seek higher beauty standards. 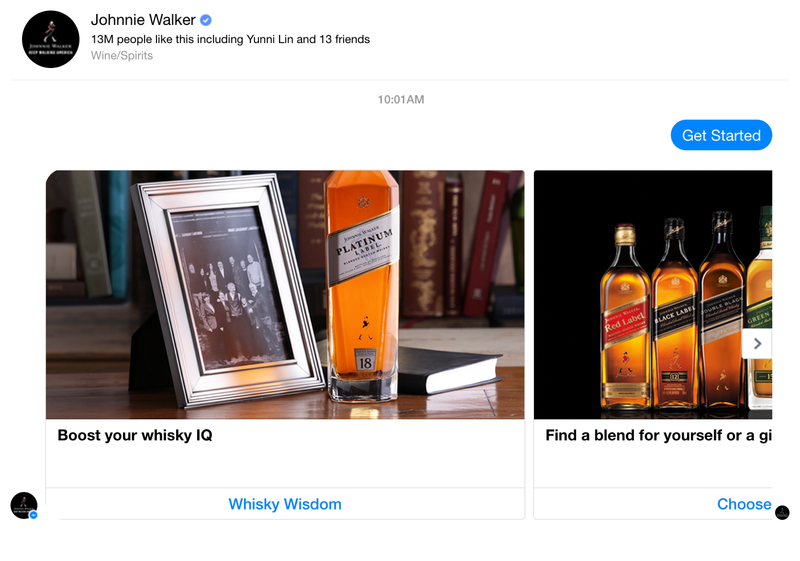 Johnnie Walker created a bot that educates users about their rich history and allows them to discover the right blend of whisky. The bot also gives cocktail suggestions based on blend of whisky or drinking occasion. Then as a call to action the bot allows users to find stores that sell their products. Yahoo Weather has a general purpose weather bot that gives weather notifications and forecasts. While simplistic in nature, this extension of their main site creates active engagement and can propel their customers to use their other services such as Yahoo Finance or Yahoo News. 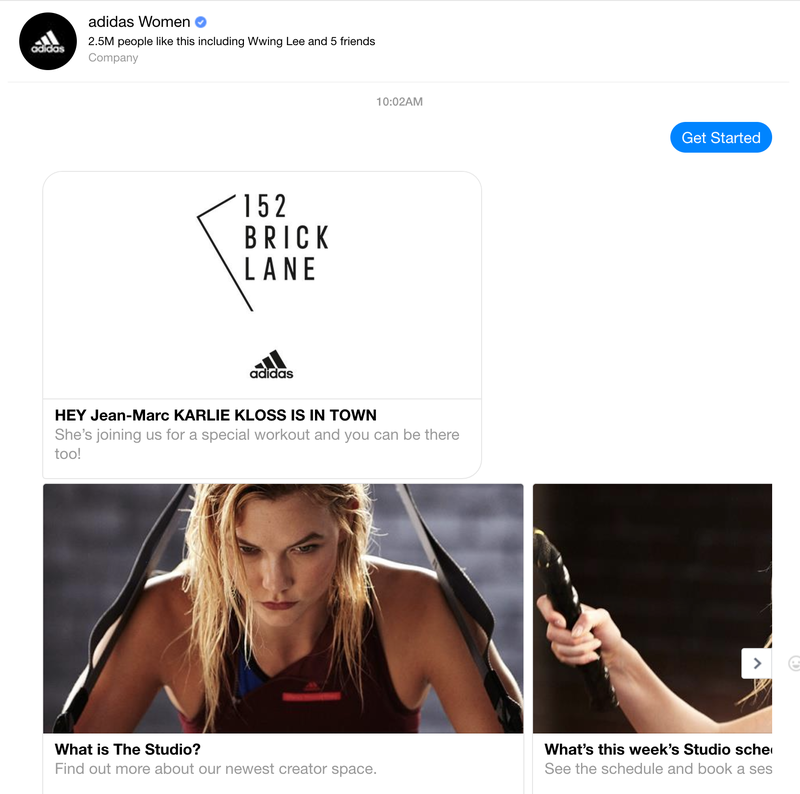 Adidas Women UK has a messenger bot to schedule a session in the Adidas LDN “Studio”. This in turns creates a deeper connection with a target customer and in turns gives people something to share. By having numerous people book these sessions easily, Adidas is creating a micro-community centered around a common topic. 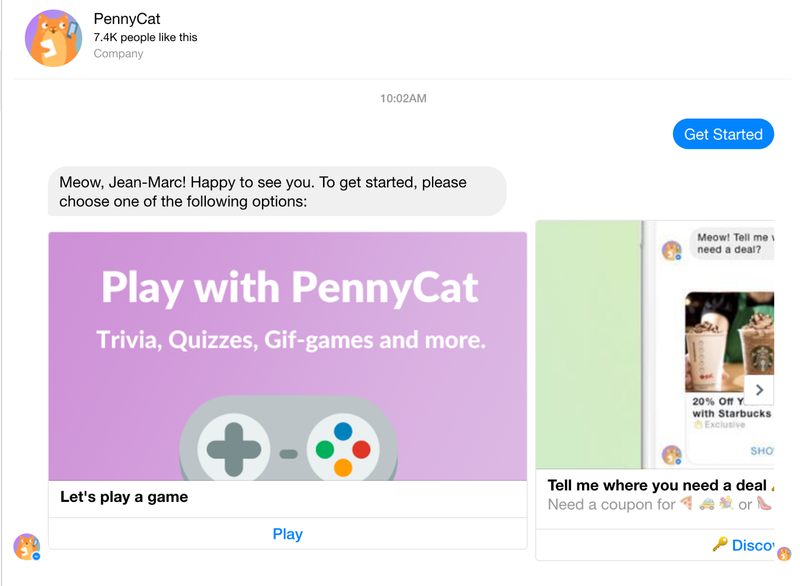 PennyCat is a messenger bot that helps users search for coupons and promotions based on the stores that users enjoy. The bot shows coupons that then direct users to a brand’s website to make a purchase. Through bots, brands can engage users by sending them coupons and promotions based on location and interests. The technology behind bots, artificial intelligence software, is dramatically improving at a faster pace. With the backing of Silicon Valley giants Google, Facebook, Slack and others, bots are moving toward being more humanlike in interaction. This means greater opportunities for marketers to leverage these tools to better sell to consumers. Facebook which powers 900 million Messenger users is a huge opportunity for companies looking to reach their audience. People are not inclined to install many apps, even from the brands they love, but nearly everyone is connected on Facebook. Bots present an extension without having to add an additional app to your user’s smartphone. A bot is ever so present and online 24/7. While people are getting fatigued with apps, bots are still in its infancy and require little setup and add-on. Not only are mobile apps expensive to build and maintain, they require careful planning for different markets, access to specific app stores, different architecture for devices and ongoing maintenance. Bots, on the other hand, live in other platforms. They require little oversight, updating and maintenance. While it is true that you are tied into a platform, majority of companies already have adopted social pages as part of a branding strategy (adding a chatbot onto your Facebook page extends your conversation with your customers). The ideal compromise is the creation of both an app and a brand bot which serve to target different subset of users. Leaving breadcrumbs in different channels to bring your brand closer to your customers. There is a growing adoption of bots because the development time is relatively lower and the use cases are specific. Finding prices, ordering an item or getting product info are but the start. They haven’t scratch the surface of what a bot can do. In the future as Artificial Intelligence evolves, we are going to see bots performing complex tasks, talking and linking with each other to perform a whole series of actions to improve the customer experience. 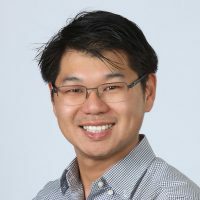 Imagine a bot being able to connect to your car for automated start up, programing the day’s commute and monitoring the fuel level. All without you having to lift a finger. For companies and brands, this means increasing the purchasing point a consumer has. Being able to order on the fly or better yet, having a bot that automatically orders things for you as you run out (ie. Amazon Dash or Smart Refrigerators) can be powerful opportunities for companies. Referred to Chase Credit Card from Affiliate such as NerdWallet -> Visit Chase Sapphire Preferred -> Visit Chase Sapphire Reserve -> Use Card Comparison Tool. The persona (with your point scale) I am then given is that of someone looking to sign up for a credit card, someone who has done a bit of research and deciding between two. This is a perfect opportunity for a chatbot to interact with the consumer with the information above. A tailored bot to this persona can convince me to become a Chase customer simply by interacting, providing relevant information and take me through the signup/checkout flow. As of now, on Chase’s website, I am free to leave the website and view their competition. Adding consumer facing bots throughout your site can increase your conversions without adding extra staffing. Marketers are trained to #ABC (Always Be Closing) and bots can be utilized to effectively close the on-the-fence consumer. 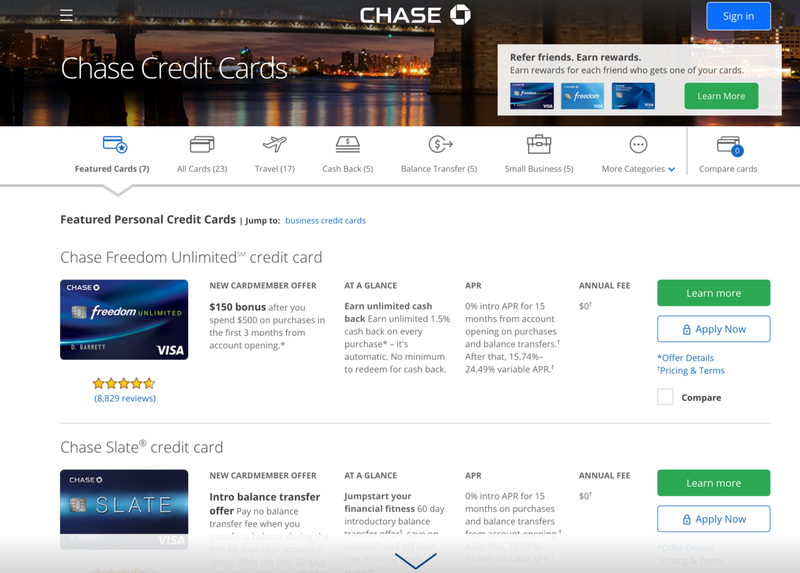 Note: Chase can implement multiple chatbots on their site targeted to different customer types and triggered by certain actions. A chatbot to help choose the right card (based on a conversation of need and preference) or a bot to explain how to get the most benefit from a specific card. There is no one-size fits all but with the flexibility of bots, there is greater potential for all bases to be covered. One of the benefits of using bots as customer engagement tools is the ease of distribution on available platforms and channels. However to be effective your bot needs to be where your customers communicate. Most people communicate on multiple platforms and not every customer uses the same application. It is thus beneficial for brands to deliver the bot experience across different channels. Cross-platform development becomes important at this point by lessening the time to market of your bot, you get customer interaction and data as soon as possible. The process to build a cross-platform bot using Recime. By diversifying your communication channels, not only do you leave breadcrumbs to interact with your brand, but you cover a wider net of audience across the world. We are seeing more companies utilizing bots throughout their online presence. The significant shift in strategy paves the way for a more robust and better consumer experience (bots never sleep after all) giving companies increase reach. As Mark Zuckerberg foreshadowed correctly, consumers can now message a business as they would a friend. While this task is often answered by a customer support agent, soon we will see the rise of bot agents who will be programmed to receive incoming message and either resolve, assist or promote the business. This future is closer than we think. Are you ready to stay competitive and adopt these tactics? Recime.io is a developer platform to build cross-platform bots saving time and cost. It is free for personal and open-source bots and royalty free. If you have a bot that is solving a problem, helping the community or you are hitting into scaling issues or want to go cross-channel with a single codebase then we would love to hear from you!